The Riverfront Theatre and Arts Centre TheatreThe Riverfront is a thriving arts centre, full of activities for participation, enjoyment and education, with a diverse range of live entertainment, workshops and free exhibitions. 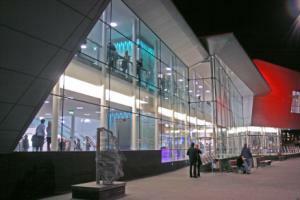 The bar and caf, helpful staff and relaxing surroundings make it an exciting building to enjoy by day and night. The Riverfront is a multi functional venue that seeks to bring as many people as possible into contact with the arts and creativity, whether as spectators or active participants. It does this through a programme of performances, film screenings, exhibitions, classes and workshops and also offers the facilities available to hire. Up to 180 professional performances, 110 film screenings and 550 workshops are directly managed and promoted by The Riverfront every year, which is 26 events or activities on average that take place each week. The Riverfront foyer also displays and sells a small selection of locally hand crafted cards, pottery and jewellery. Books, toys, stationery and arts/crafts packs are also available for sale at prices to suit every pocket. Sweets, ice-creams, selected show merchandise and programmes can also be purchased before a show and during the interval. The Riverfront is a thriving arts centre, full of activities for participation, enjoyment and education, with a diverse range of live entertainment, workshops and free exhibitions. The bar and caf, helpful staff and relaxing surroundings make it an exciting building to enjoy by day and night. There is a small cloakroom that charges 50p per item and we are happy to look after your pushchair for the duration of a show. Monday to Saturday 10:00 - 20:00.